I finally got a break from laughing over S&P’s threat of downgrade of U.S. debt. You may remember S&P as the credit rating agency that would rate a security: “structured by cows,” which was said by one of its analysts in reference to S&P’s proclivity for stamping subprime mortgage backed securities with investment grades. But now S&P is warning us all that we better get very concerned about the budget deficits or else they will downgrade the government’s debt. I have to say that this is hard to take seriously from almost every angle. First, what does it mean that the U.S. government’s credit rating is impaired? We borrow in dollars. Guess who makes dollars? Imagine if I printed up IOU’s that were payable with my IOU’s. Would S&P think that I might default? This makes no sense. Countries that borrow in a currency they issue will not default unless we get an absurd situation where politicians try to make a point by forcing a default (as in not raising the debt ceiling). It will not happen as a result of budget finances. There is a potential issue about inflation and higher future interest rates (and therefore lower bond prices). However, if this is the event that S&P is warning against, then the warning should have been applied to all debt that is denominated in dollars, both public and private. If inflation erodes the real value of U.S. government debt, it will also erode the real value of the dollar denominated debt issued by Goldman Sachs and General Electric. Are these two companies now on the watch list for downgrades along with the rest of corporate America? I don’t think so. A friend sent over a Moody’s publication on how they gage sovereign default risk. It actually was quite interesting. First of all, their key variable is the ratio of interest payments to revenue. This must have the tax and spend crowd partying in the street. Suppose that we raise the amount of revenue we take in by 1 percent of GDP (roughly $150 billion a year). If we use Moody’s 18 percent interest to revenue warning line, this additional tax revenue will allow us to accumulate an amount of debt equal to 3.6 percentage points of GDP ($540 billion) before enter the trouble zone. By contrast, cutting $150 billion in annual spending doesn’t buy us anything in terms of raising the amount of debt that we can safely hold. So the Moody’s story is pretty clear: deal with your deficits by raising taxes rather than cutting spending, if the point is to preserve that golden Aaa rating. The other item that is striking in this picture is that we have been here before and then some back during the Bush presidency. The ratio of interest to revenue peaked at 18.2 percent in 1992. After falling back slightly with the recovery, the Congressional Budget Office (CBO) projected (Table 4-1) that it would cross 20 percent by 2000 and would exceed 24 percent by the end of projection period in 2003. By comparison, the current projections look very mild. In the CBO baseline (Table 1-4) the interest to revenue ratio would be just 16.0 percent in 2021. Arguably the baseline is an overly optimistic budget picture, but the budget story would have to turn far more negative to come close to the projections that CBO made in January of 1993. Source: CBO 1993 and 2011 and author's calculations. The other question for the fun-seeking among us, is what happens to this picture if the Fed decides to buy and hold an amount of debt equal to 20 percent of GDP ($3 trillion). The Fed is pretty much there now with its quantitative easing (QE) policy. The difference between this policy and the current baseline is that the Fed is expected to sell off most of the assets it has acquired under it QE policy. However suppose instead that it continued to hold them over the next decade. The Fed could raise reserve requirements to offset the impact that this action would have on the money supply, thereby preventing inflation. If the Fed continued to hold this debt, then the interest paid on this debt would be refunded right back to the Treasury, creating no net interest burden for the government. If Moody’s definition of net interest meant interest actually paid out by the government, then our CBO baseline would look even more benign after being adjusted in this manner as shown above. In this case, the ratio of interest payments to revenue stays under 13 percent over the 10-year projection period. It is hard to see any good reason why the buy and hold policy would not be on the agenda – except of course that it is likely to reduce bank profits. Of course this whole discussion of the federal government defaulting is just silly – presumably it is designed to push political ends. It is hard to believe that there is not more outrage over being lectured on responsible fiscal policy by the bond-rating agencies whose irresponsibility contributed so much to this crisis in the first place. There would not be 25 million people unemployed, underemployed, or out of the workforce altogether if the bond rating agencies had actually used some judgment in rating the securities issued by the Wall Street investment banks. We would also have much lower budget deficits. In his most recent column, “Middle-Class Tax Trap,” Ross Douthat laments what he sees as the unconscionable tax burden that a new CBO report projects for middle-class families in 2035. But, Douthat misses the most important part of the CBO projection: Even after the big tax increase, CBO projects that middle-class families will be much better off in 2035 than they are today. But, let’s look at the CBO report (pdf) he cites. In that document (see Table 4-4), the median income for a “married couple with two children filing a joint return” in 2010 was $94,900. According to CBO projections, by 2035, the median income for the same family type –also in 2010 dollars– will be $145,200! S&P managed to capture the headlines yesterday when it announced that it had a negative outlook for the credit rating of the United States. After all, an actual credit downgrade for the United States government would be big news. While the immediate response was a boost to the deficit hawks’ efforts to cut programs like Social Security and Medicare, it is worth asking a few questions before we surrender these programs to the Wall Street numbers mavens. The last time S&P was in the headlines it was for giving investment grade ratings to hundreds of billions of dollars of securities that were backed by subprime and ALT-A mortgages. These mortgages were used to buy over-priced homes at the peak of the housing bubble. Many of these mortgages not only carried high risks, but were fraudulent, with lenders having filled in false information to allow homebuyers to qualify for loans that their assets and income would not justify. Serious people should ask what S&P has done to improve its ratings systems. Have they changed their procedures? Did the S&P analysts who gave AAA or other investment grade ratings to toxic junk get fired or at least get demoted? If not, should we assume that S&P used the same care in assigning a negative outlook to U.S. government debt as it did in assigning investment grade ratings to toxic assets? Of course it was not just bad mortgage debt that stumped the S&P gang. It gave top quality investment grade ratings to Lehman until just before it imploded in the largest bankruptcy in history. The same was true of AIG, which would have faced a similar fate without a government rescue. Bear Stearns also had a top rating until the very end, as did Enron. In short, S&P has a quite a track record in missing the boat when it comes to assessing creditworthiness. This week, we post links to reports from Center on Budget and Policy Priorities, Drum Major Institute for Public Policy, Economic Policy Institute, Institute for Research on Labor and Employment UC Berkeley, and Political Economy Research Institute. Turning the Page: Are Developing Countries Bouncing Back from 20 Years of Stagnation? CEPR often mentions the long-term economic slowdown that hit low- and middle-income countries beginning in the 1980s. But as our recent Scorecard shows, over the last 10 years something remarkable has happened: low- and middle-income countries have begun growing again, at rates rivaling those they had before 1980. This collection of “V” shapes shows economic growth for 191 countries, divided into quintiles from poorest to richest.i Every quintile saw its GDP slow by about half – or more – between 1980 and 2000. 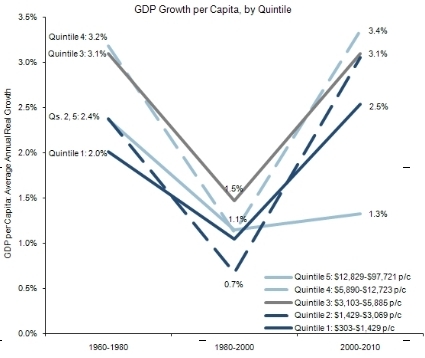 Quintile 2 (low-income countries with between $1,429 and $3,103 in per-capita GDP) actually saw GDP slow by two-thirds. But after 2000, the low- and middle-income groups saw their growth rebound to at least as high as it was before 1980. Only the fifth quintile (rich countries with at least $12,829 in per-capita GDP) saw continued stagnation: their GDP inched up from an average of 1.1% per year to 1.3%. Why did progress slow so dramatically for 20 years and then speed up again? Those two decades saw widespread adoption of neoliberal economic policies: tighter fiscal and monetary policies; reduced tariffs and non-tariff barriers to trade; financial deregulation; privatization of state-owned enterprises; increased protectionism in the area of intellectual property; and the general abandonment of state-led industrialization or development strategies. It would be nearly impossible to econometrically identify the contributions of various reforms to the slowdown, but the fact that these reforms coincided with such a sharp, long-term decline for the vast majority of low- and middle-income countries is at least prima facie evidence that on the whole, these reforms contributed to the failure. As usual, the economic debate in Washington is ignoring the country's main problem. We are debating taxes and spending cuts when the real problem is boosting demand. Unemployment is the most immediate problem facing the country. We still have 8.8 percent of the labor force unemployed. And in spite of the happy talk about the economy being on the right path and the recent pace of job growth, the entire decline in the unemployment rate over the last year was the result of people dropping out of the labor force. The share of the work force that is employed remains near its low-point for the downturn. This is the economic reality and if we had an honest debate in Washington, the two parties would be putting forward competing plans to create jobs, not reduce the deficit. The current deficit is not a problem. If the deficit were smaller, then we would simply have less spending in the economy and more people unemployed. There is not some magic wand that will make the private sector increase spending and add jobs just because the government lays people off. Last month, the real of the dollar against other currencies hit a new record low. Aside from a brief spike in late 2008 — the result of a crisis-induced "flight to safety" — the dollar has undergone a steady decline since early 2002. Over the last nine years, the dollar has fallen 27 percent relative to those of major trading partners. What happens to the economy as the dollar falls? At first, U.S. importers of (say) British goods trade more dollars to get the pounds they need to purchase British goods. This means that the cost of imports measured in dollars rises, increasing the size of the trade deficit (imports minus exports). Similarly, British importers of American goods find they require fewer pounds to get the dollars they need to buy American goods. Over time, Americans notice that British goods have become more expensive in comparison to domestically produced goods. In other words, the price of U.S.-made sweaters becomes cheaper relative to the price of sweaters imported from Britain. This will lead us to buy fewer sweaters from Britain and more domestically manufactured sweaters. Mad Men, Then or Now? The fictional television series "Mad Men"” does a great job dramatizing the astonishing cultural, social, and political transformation of the United States since the early 1960s. A new report (pdf) from the Institute for Policy Studies now adds some insight into one of the key economic differences between then and now. 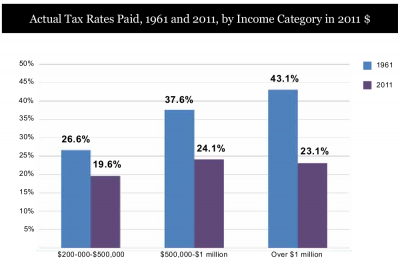 This graph from the report compares the actual income taxes paid by the rich in 1961 and 2011. As it happens, 1961 falls right between the time covered by seasons one (March to November, 1960) and two (February to October 1962) of "Mad Men." Back in 1961, Don Draper and his partners at Sterling Cooper paid somewhere between 27 and 43 percent of their income in federal income taxes. Their counterparts today pay somewhere between 20 and 24 percent. As the IPS report argues, we don’t need austerity, we need tax increases at the top. This post originally appeared on John Schmitt's blog, No Apparent Motive. I've said it before, and I'll say it again: There is a simple alternative that involves no government money and no new bureaucracy. We could temporarily change the rules on foreclosure to allow homeowners the right to stay in their home as renters for a substantial period of time (e.g., 5 years) following a foreclosure. This week, we post links to reports from Center for American Progress, Center for Economic and Policy Research, Center on Budget and Policy Priorities, and Economic Policy Institute. Since Representative Ryan is running around pushing his Medicare vouchers I might as well take the opportunity to push my own. It seems that Mr. Ryan and I have something in common, we both like Medicare vouchers. Of course there are big differences between our systems. Ryan's voucher system would deny seniors the option to stay in the existing Medicare system. It would give them a lump sum which they could then apply towards the cost of an insurance premium. There is no guarantee that either the insurance they bought would be as good as Medicare, nor that the voucher would cover the full cost of the insurance. By contrast, the Baker voucher leaves the current Medicare system intact, seniors would always have the option to be in the Medicare system just as they do today. The change created by the Baker voucher is that seniors would also be able to buy into the health care systems of any of the countries with longer life expectancies than the United States. The big advantage to seniors is that they would be able to pocket half of the savings. The government gets the other half. Because our health care system is so inefficient, this is big money. The cost to the government per beneficiary is projected to be nearly $13,000 (in 2008 dollars) by 2020. The average cost of treating a person over age 65 in the countries with longer life expectancy is projected $9,600 (also in 2008 dollars). If we allow the receiving country a 10 percent premium (this ensures that they share in the savings) and split the difference, the value of the voucher would be $11,300, allowing the federal government to save $1,700 for every beneficiary that took advantage of the voucher. The gains to seniors will depend on which country they chose. Since they also would have substantial out of pocket medical expenses if they stayed in the United States (including their Medicare premiums) their savings from moving to another country to get care would be considerably larger than just the difference between the value of the premium and cost of care in the receiving country. Seniors that moved to Canada would be able to pocket $5,600 a year. Those that moved to Spain could pocket $10.900, and those that went to New Zealand could pocket $11,200. These numbers get much larger through time. By 2045, the annual savings to a senior moving to Canada, Spain, and New Zealand would be $22,600, $26,700 and $29,400, respectively. This would more than double the income of many retirees. The savings to the government would rise accordingly. The deal gets even better for people who qualify for both Medicare and Medicaid. For these people, the government would just split the savings, handing half to the beneficiary and pocketing the other half. This deal would allow dual beneficiaries going to Canada, Spain, and New Zealand in 2020 to pocket $13,500, $18,700, and $18,900, respectively in 2020. By 2045, the annual savings for seniors going to these countries would rise to $37,800, $41,700 and $41,900, respectively. That's the Baker proposal. It doesn't require setting up a complex new domestic voucher system. It just requires some negotiations that would allow our retirees to buy into foreign health care systems. Hey, even a trade negotiator should be able to do that. The big difference is that the Baker proposal is likely to take some money out of the hides of the domestic health care industry, while ensuring that seniors continue to get quality care. By contrast, Representative Ryan's plan takes money out of the hides of retirees while protecting the incomes of the health care industry. It's a matter of priorities. This week, we post links to reports from Economic Policy Institute, UCLA Institute for Research on Labor and Employment, and National Employment Law Project. That's the analysis from the Heritage Foundation. They calculate the cumulative trade deficit over the next decade will be almost $1 trillion greater under the plan put forward by Representative Ryan than under the current baseline. This is measured in 2005 dollars. If we used current dollars then the sum would be more than $1.3 trillion over the course of the coming decade. The borrowing from China theme is one that many of the deficit hawks have harped on repeatedly so it is interesting that their own plan, by their own assessment, will lead to more borrowing from China and other foreign investors than the status quo. This analysis is helpful because it points out that our borrowing from foreigners is determined by the trade deficit, not the budget deficit. So even though Representative Ryan's plan is projected to substantially reduce the budget deficit, it still leads to a larger trade deficit and more borrowing from abroad. Of course caution would be advised in using the Heritage Foundation analysis that is the basis of these projections. This analysis shows the Ryan plan creating an additional 831,000 jobs compared with the baseline over the year 2012. This additional job growth is projected to be associated with a 2.1 percentage point decline in the unemployment rate. With a civilian labor force of more than 150 million, this doesn't seem to add up. The Heritage Foundation projections also show the unemployment rate falling to 2.8 percent by 2020, a level not seen since the end of World War II. The economy added 216,000 jobs in March, pushing the overall unemployment rate down to 8.8 percent, but African Americans do not appear to be sharing in the benefits of recent growth, according to the latest Bureau of Labor Statistics' employment report. The employment-to-population ratio (EPOP) for African Americans fell by 0.3 percentage points to 51.9 percent, just 0.1 percentage points above the recession low hit in September. The EPOP for black teens stands at just 14.8 percent. The overall unemployment rate for African Americans rose by 0.2 percentage points to 15.5 percent. Overall, the recent acceleration in job growth is encouraging, but it is still an extremely weak recovery from a severe downturn. Based on the experience of the last two severe recessions, 1974-75 and 1981-82, we should be expecting job growth in the range of 400,000 a month. Instead, we are still seeing a rate of job growth that is below the 250,000-a-month average from the 90s. For more information, read our latest Jobs Byte. CEPR Co-Director Dean Baker co-authored a report with the Center on Wisconsin Strategy that found that the Wisconsin retirement system is one of the healthiest in the country. The paper was mentioned in this Reuters article, among others. Dean authored several op-eds on public pensions, and on March 15th he testified before the House Oversight and Government Reform Committee’s Subcommittee on TARP, Financial Services and Bailouts of Public and Private Programs on state and municipal debt. A video of the testimony can be seen here. Dean also discussed cuts to state budgets on MSNBC’s Rachel Maddow Show. An earlier CEPR report shows that many of the problems facing state and local governments are due to the recession and not, as some have claimed, public worker compensation packages. CEPR Co-Director Mark Weisbrot also weighed in on events in Wisconsin in this op-ed for The Guardian Unlimited. Paul Krugman tears apart a new post from John Taylor in which he attributes high unemployment to the falloff of investment, noting the sharp decline of investment as a share of GDP. Taylor's remedy for this problem is to spur investment by cutting business taxes. Krugman shows that the bulk of the falloff was due to a falloff in residential investment. In other words, housing construction plummeted following the collapse of the housing bubble. Actually, Taylor's case is even even weaker than the picture Krugman shows. There was also a bubble in non-residential real estate. The falloff in non-residential construction is due to the fact that there was enormous over-construction in most categories of non-residential construction. Tax breaks are not going to persuade builders to put up another office building or mall in a glutted market. For the fourth consecutive month, the Case-Shiller 20-City index fell by at least 1.0 percent. It is now down by 5.4 percent from its peak in July. Of the 20 cities in the index, 19 had a drop in housing prices in January, with the exception again being Washington, D.C. Prices in D.C. edged up by 0.1 percent. Prices are now down by 3.1 percent from their year-ago-levels. In nominal terms, prices are still 1.1 percent above their previous post-bubble low in April of 2009; however, in real terms they are already 2.2 percent lower. Seattle and Portland continue to rank near the top for largest price declines, with prices falling by 2.4 percent in January in Seattle and by 1.8 percent in Portland. Over the last three months prices have fallen at an annual rate of 19.9 and 16.3 percent respectively in the two cities. The Midwest cities continued to see sharp declines, with prices in Minneapolis falling by 3.4 percent, in Chicago by 1.8 percent and in Detroit by 1.7 percent. Over the last three months, these cities have seen annual rates of price decline of 24.6 percent, 19.6 percent and 17.3 percent, respectively. The California cities are also continuing the process of deflating their bubbles. Prices in January fell by 0.6 percent in Los Angeles, by 1.2 percent in San Diego, and by 1.7 percent in San Francisco. The annual rate of decline over the last three months in these cities was 9.2 percent, 7.2 percent, and 14.9 percent, respectively. These declines may accelerate as the impact of the state’s homebuyer tax credit fades. Check out our latest Housing Market Monitor for more. Can the U.S. Economy Survive the Republicans' Definition of Success? That's what millions are asking after the Republican staff of the Joint Economic Committee (JEC) put out a paper outlining their strategy for achieving economic prosperity by cutting government spending and laying off workers. The central claim in the paper, that cutting spending even in the middle of a downturn will lead to growth, is contradicted by a careful analysis of this topic that the IMF published last fall. But maybe the problem is more basic than a disagreement on economic research and a reading of data. It seems that the problem might stem from the meaning of the word "success." Readers of the JEC report will see that New Zealand in the years since 1986 is highlighted as one of the success stories. The Republicans tell us that if we make the same sort of harsh cuts in domestic spending as New Zealand and have the government take comparable steps to weaken the power of labor unions then we can look forward to the same sort of economic progress as New Zealand. This should have people really worried. If we go the OECD and look up New Zealand's growth in real per capita income since 1986 we find that it came in third from last, beating out only Switzerland and Iceland. According to the OECD data, real per capita income in New Zealand grew by a total of 18.9 percent in the 22 years from 1986 to 2008. Source: OECD and Bureau of Economic Analysis. This is less than 40 percent of per capita income growth in the United States over this period. Do the Republicans really wish that we had followed New Zealand's path back in the mid 80s so that we could be 20 percent poorer today? We were not the only ones who outpaced New Zealand's "success" story. Germany and France both had almost two and half times as much income growth as New Zealand. Those flaky Scandinavian types in Denmark and Sweden also had more than twice as much income growth as New Zealand over this period. If we think there is a regional aspect to New Zealand's slow growth it does not appear to have infected Australia, which also had more than two and half times the income growth as the Republican role model. In fact, even depression wracked Japan had more than two and half times the income growth as New Zealand over this period. Japan has certainly had its problems over the last quarter century, but they don't seem to have damaged its economy to the point where it performed worse than New Zealand's by this basic measure of economic progress. Clearly the Republicans have some other measure of success than the ones that economists usually apply. New Zealand's economy did grow slowly but there was also a large increase in inequality and a serious weakening of the rights of workers. Perhaps that is what they see as the country's success since 1986. Back in November, John Schmitt and I wrote a report that estimated the number of people in the United States that have ever been to prison or convicted of a felony. We were interested in the number because a prison record or a felony conviction is a major impediment to employment. We concluded that there were about 6 million people with a prison record and somewhere between 12 and 14 million with felony convictions. Our calculations suggested that the difficulties that these groups face in the labor market probably reduce employment by 1.5 million jobs and cost the economy about $60 billion a year in lost output. "In the right situations, criminal background checks promote safety and security at the workplace. However, imposing a background check that denies any type of employment for people with criminal records is not only unreasonable, but it can also be illegal under civil rights laws. Employers that adopt these and other blanket exclusions fail to take into account critical information, including the nature of an offense, the age of the offense, or even its relationship to the job." While the report notes "a promising shift in policy and practice" towards "fairer and more accurate criminal background checks for employment," perhaps what is most discouraging is that existing anti-discrimination laws are often not being enforced, at the federal, state, or local level. NELP lays out four recommendations that would steer our country towards more reasonable employment screening procedures: 1) That the federal government enforce existing protections relating to background checks, 2) that the federal government adopt fair hiring policies for federal employment and contracting, serving as a model for all employers, 3) that state and local governments certify that their hiring policies comply with federal regulations and launch employer outreach and education campaigns, and 4) that employers take a more active stance in promoting fair hiring policies, for both their own and workers' best interests. The authors highlight the compelling, obvious reason for following these recommendations: "millions of deserving workers will have a fairer shot at employment, allowing them to contribute to their communities and help rebuild America’s economy." This week, the LMPRR features reports from Center for Economic and Policy Research, Center on Wisconsin Strategy, Economic Policy Institute, UCLA Institute for Research on Labor and Employment, and National Employment Law Project. Farm Exports and Farm Labor: Would a Raise for Fruit and Vegetable Workers Diminish the Competitiveness of U.S. Agriculture?